What’s that picture all about? There’s an awful lot of talk about “author branding.” On one hand, that sounds icky-commercial. On the other hand, however, if you’ll just think of it as a contract with your readers, then branding can be a great way not only to find one’s best possible audience but also to narrow one’s professional focus. Example: what’s Jane Austen’s contract with her readers? That you’ll have female characters looking for husbands and all the drama that ensues. See what I mean? I write in whatever genre God assigns (science fiction, murder mystery, biblical historical fiction, and more to come, I hope). Just promising you a specific genre of story probably won’t work. So what can I, Author Erin McCole Cupp, promise you? 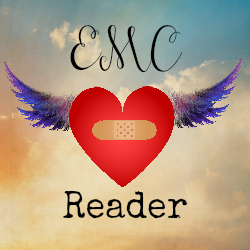 Long ago, I made my mission statement as a writer, “To rip out your heart, stomp on it, and then give it back to you, healed and with wings.” So that’s my contract with my readers. I will do everything within my power to give you stories that make you feel hurt but healed and hopeful–just like life makes you feel, if you live it right. More is coming soon. Please check back here for updates. Again, thank you to Cristina! She made such a pretty badge!